In addition to its normal plain-text and hexadecimal modes, DataWedge can output acquired data in its raw form, before the application of any encoders. This can be useful if custom encoders are needed for acquiring character sets not supported by Zebra. Raw data is received as a byte stream using the com.symbol.datawedge.decode_data intent extra. For more information, see the Intent Output guide. Raw data cannot be output as keystrokes. Inter-character delay – used to set a delay (in ms) following the delivery of each character to the application. 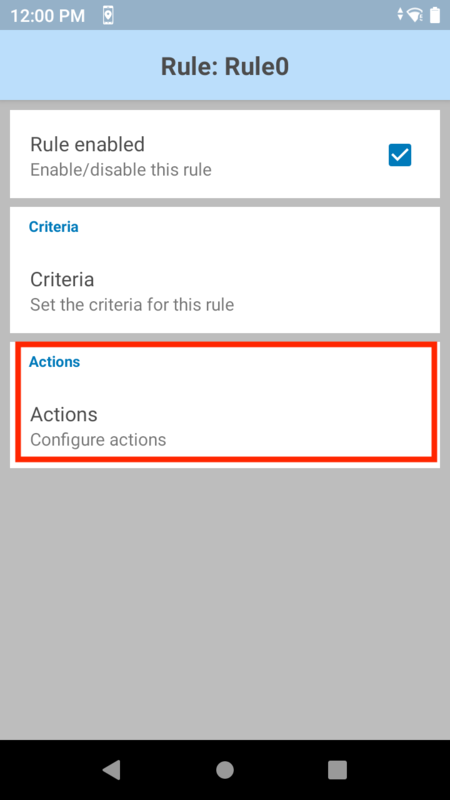 This parameter is intended to help avoid issues that arise when data is dispatched too quickly for an application to accept. Default=0. If experiencing errors in keystroke delivery, increase this value in increments of 100 (to a max. of 1000) until errors cease. Note: This parameter can negatively effect application performance. 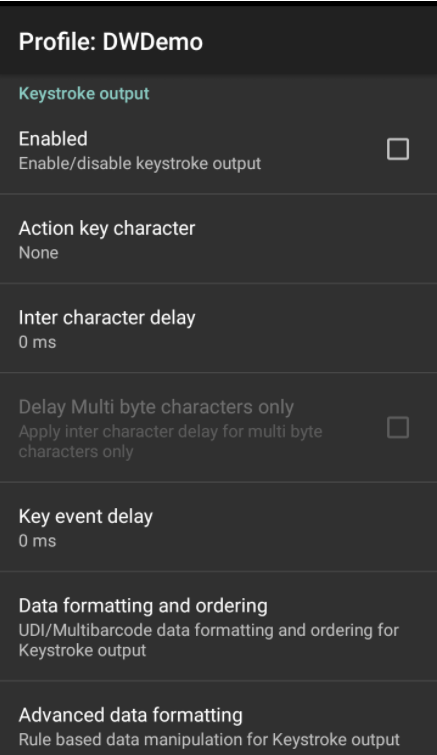 Multi-byte character delay - applies the Inter-character delay (described above) to multi-byte characters only. 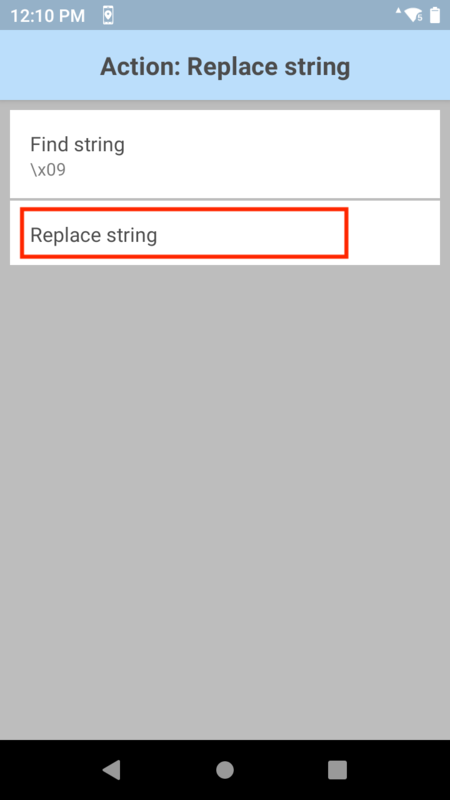 This parameter is intended to help avoid problems that arise when sending Unicode and multi-byte characters to the Android browser. 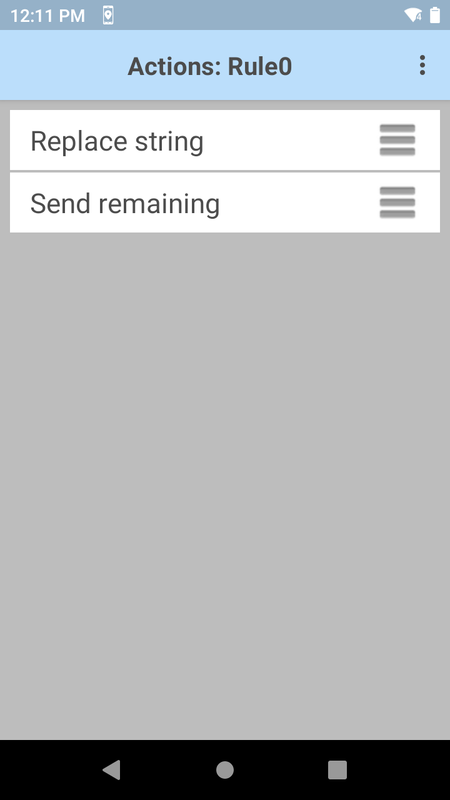 Available only when Inter-character delay is enabled. 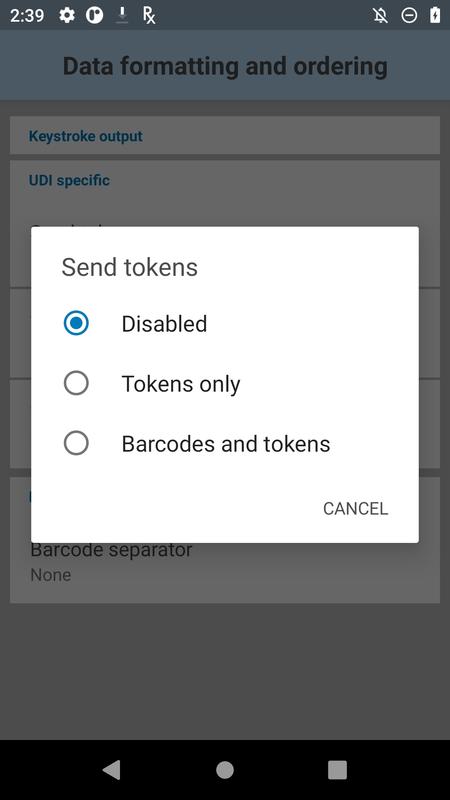 Disabled by default. 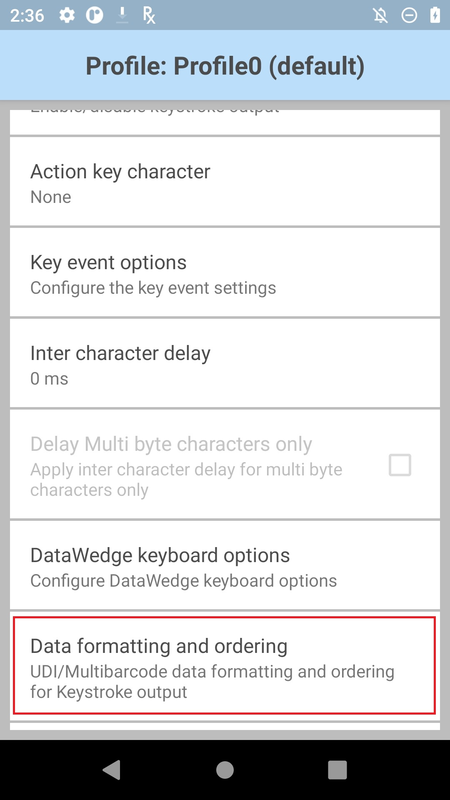 For Profiles imported into DataWedge 6.7 (and higher) from prior versions, the value specified for the "Multi byte character delay" is applied to the Inter-character delay and the “Delay Multi-byte characters only” parameter is enabled. For Profiles created with DataWedge 6.7 (and higher) and imported into a prior version, the specified delay, if any, is applied only to multi-byte characters. 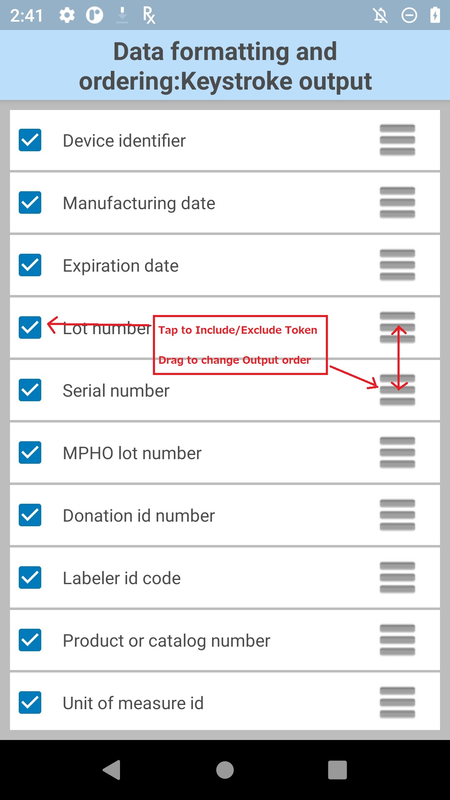 Tap "Data formatting and ordering" to specify a separator character to be inserted between the data from each barcode. 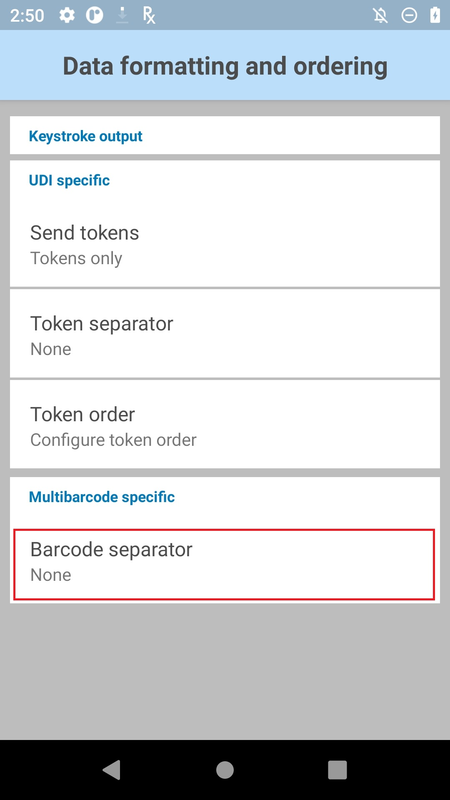 Tap "Barcode separator" to specify the desired insertion character (CR, LF or TAB). 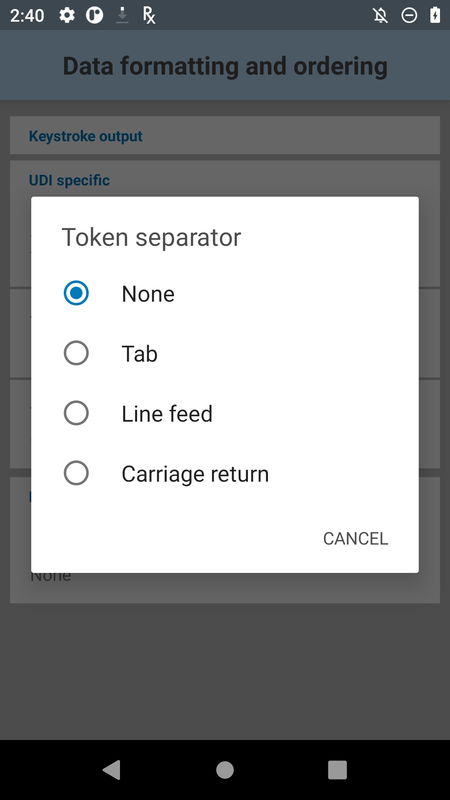 Tap "Barcode separator" to specify the desired insertion character (CR, LF or TAB). In this case, select TAB. 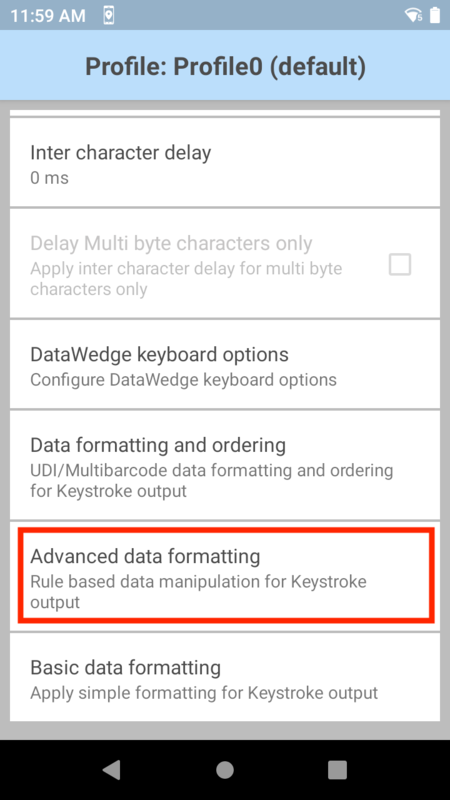 Under "Keystroke output" click Enable (tap on the checkbox). Tap Rule0. 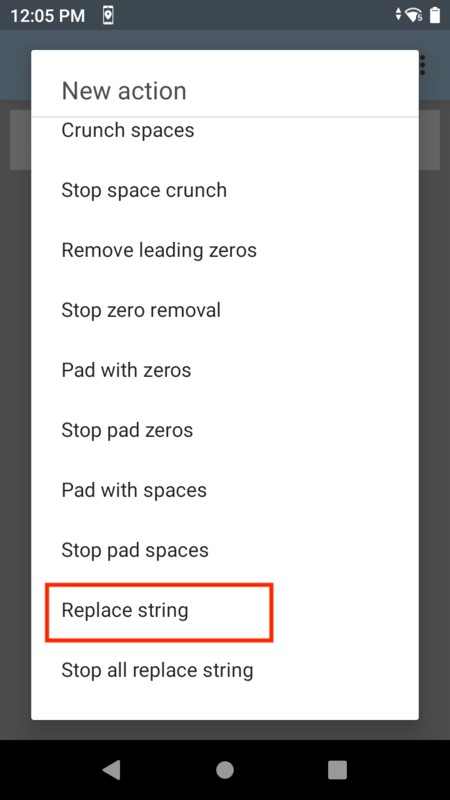 From the hamburger menu at the top right, select “New action”. Scroll down and tap “Replace string”. Enter the hexadecimal notation for tab: \x09. Tap OK. 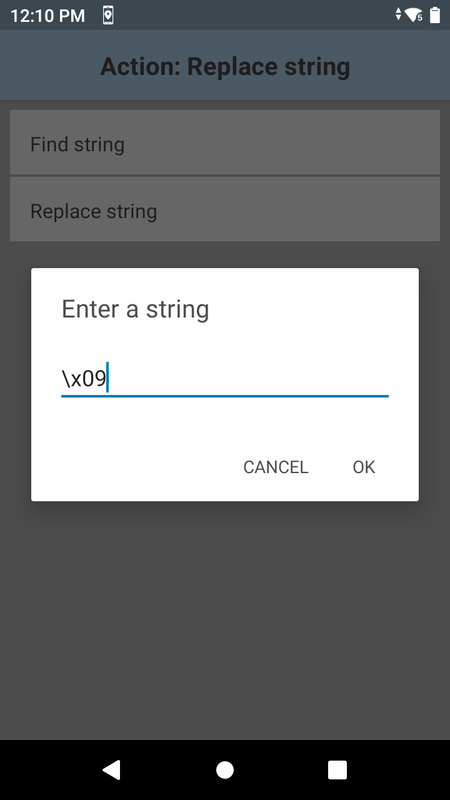 Enter desired string to use as replacement, for example "+". Tap OK. Tap back to return to the rule. 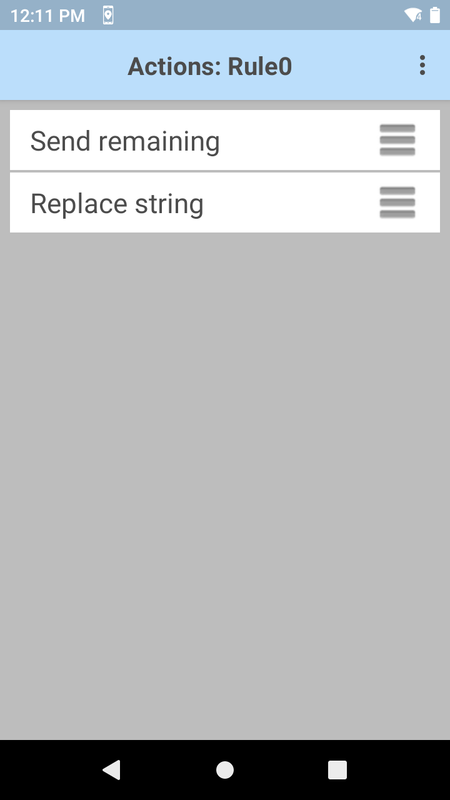 Tap and hold the horizontal bars next to "Replace string" and drag it above "Send Remaining". When performing a scan, each barcode in the MultiBarcode decode is now followed by a plus "+" character. Hex data is based on the encoded data received from the scanner framework after it's converted from its raw form to the selected character set. 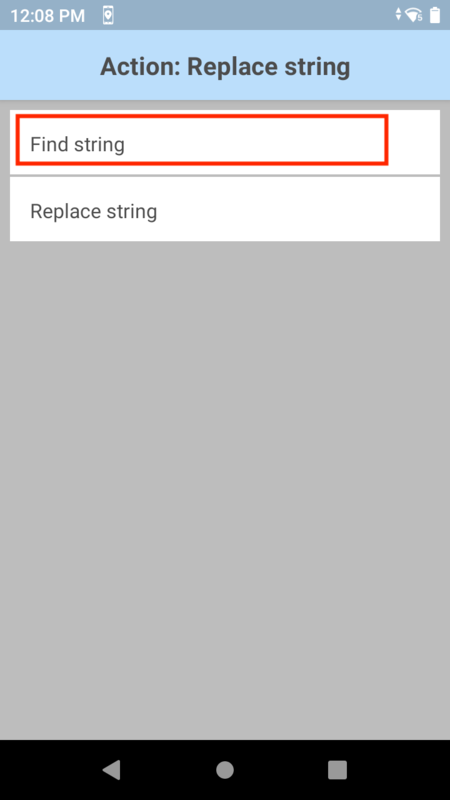 When the hex-output option is selected, the plain-text string is converted to the corresponding hex digits and output as a string. That hex data can be acquired programmatically. 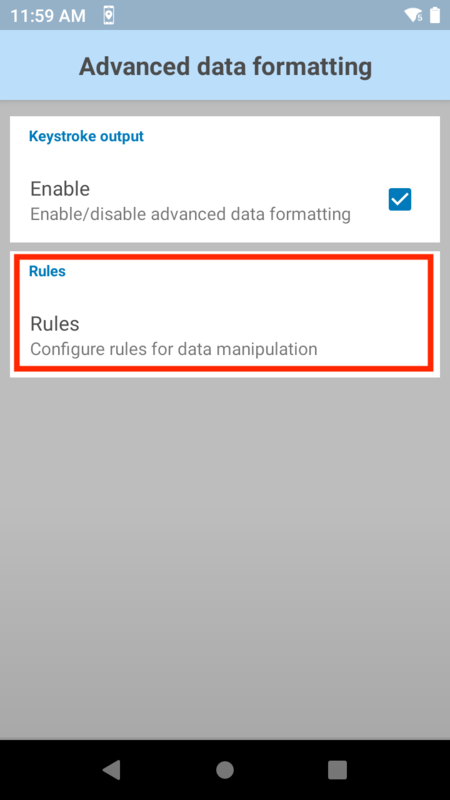 For more information and to enable hex output using the DataWedge UI, see Basic Data Formatting (BDF).